The Grey-headed Robin of Australia is not a robin as Americans would know one (thinking, inexplicably, that a thrush is a robin), nor is it a robin as an European would understand it either. 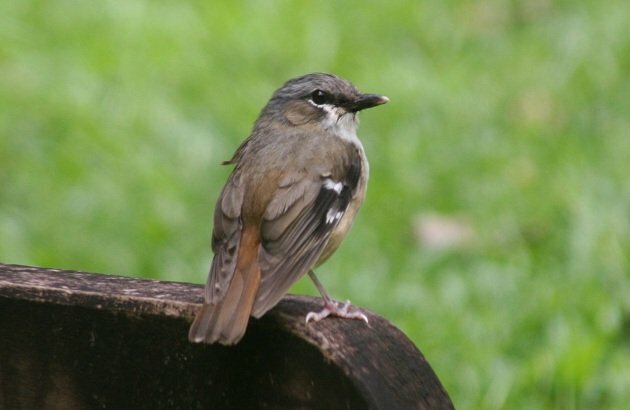 It is, instead, a member of the Petroicidae, the Australasian robins, a family mostly found in New Guinea and Australia but also reaching here in New Zealand and as far across the Pacific as Fiji. The Grey-headed Robin showing off the grey head. Until I started researching this post I didn’t know an interesting fact about the range of this species. According to my Pizzey and Knight Australian guide, it s restricted to the tropical area around Cairns, mostly in the montane area of the Atherton Tablelands, as well as the island of New Guinea. 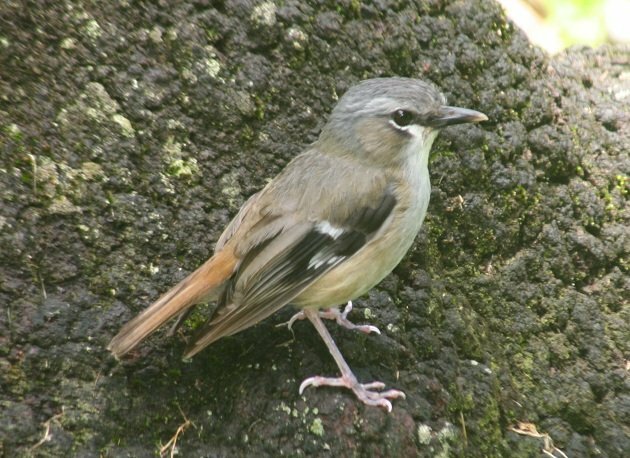 But my HBW actually splits this species off from the New Guinea species, which it names the Ashy Robin. So the species name for this species is either Hetermyias albispecularis if unsplit or Heteromyias cinereifrons if split. Looking at the pictures in the HBW I can see why it might be split, as the New Guinean subspecies are actually for the most part black-headed, with a supercillium that varies from almost black to shocking white. Studies of other sister species shared between New Guinea and Australia have found that the appearance of similarity between them can be misleading, and more research is needed to work out if they are the same species or not. Whether the Grey-headed Robin of Australia represents a toehold of a mostly New Guinean species or an endemic, it is still a nice bird. As Australasian robins go it is pretty big and chunky, and with the Ashy Robin it is the only member of the genus Hetermyias. 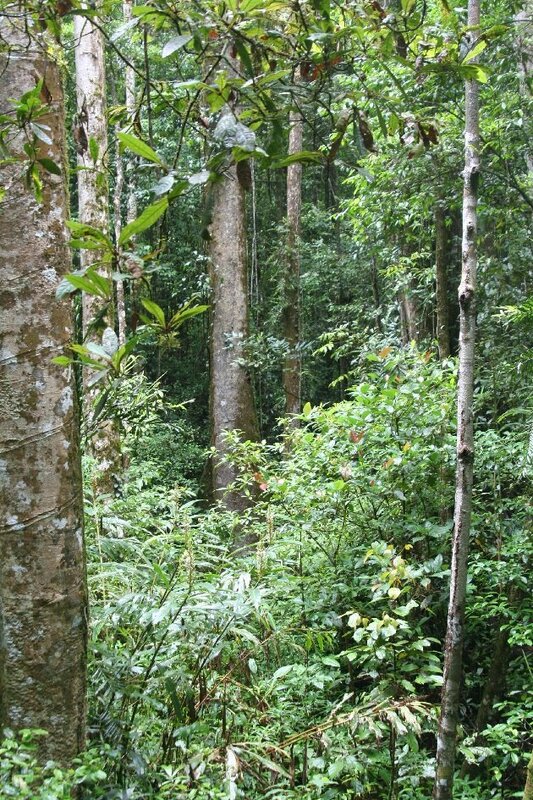 It is restricted to rainforest, where it lives on the ground. 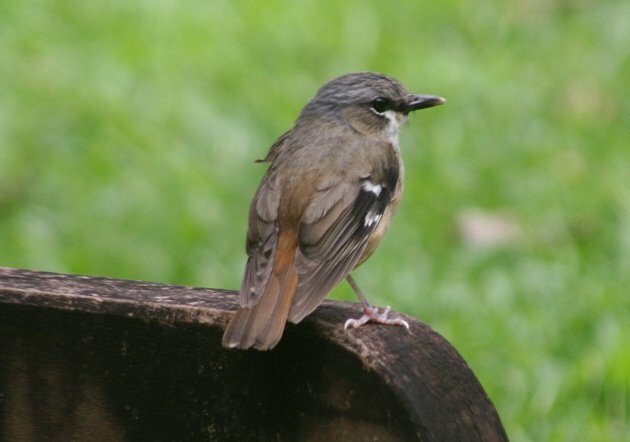 For people lucky enough to be in the Atherton Tableland the Grey-headed Robin is one of the easiest endemics to find. There are a some very tame ones in the car park of Mt Hypipmee that even allowed a terrible photographer like me to snap off a few shots. There are many great reasons to visit the area, and these guys are one of them! “The name robin is also applied to a dozen other chat-thrushes in the genera Erithacus and Tarsiger, as well as to a few other related species, notably the Indian robin (Saxicoloides fulicata), which is about 15 cm (6 inches) long, with black plumage set off by a white shoulder patch and reddish patches on the underparts. So, why is “robin” so popular? Did the British and Europeans pass on the name as they colonized the Americas, India, Australia, etc.? Is this one of the by-products of colonialism? The name robin was mostly used for plump ground living birds; today most robins are either chat-like relatives of the Old World flycatcher family or the Australasian variety. The American Robin is something of an exception, probably named for the red breast not the shape. But the trend goes way beyond robins, many unrelated species around the world have been called wrens, warblers, flycatcters and so on. They very cooperatively posed on signs at Mt Hypipmee for me too.